Taoiseach Leo Varadkar has told French President Emmanuel Macron that Ireland "can cope" with a no-deal Brexit. The exchange occurred at the end of a tense meeting of European Union leaders in Brussels last week. However, Mr Varadkar and German Chancellor Angela Merkel are said to have clashed on the border backstop issue. Last month it was reported that Mrs Merkel had urged the Taoiseach to soften his position on the backstop in order to achieve a Brexit deal. She suggested that a "creative" approach to Brexit talks could see outstanding backstop questions resolved in an agreement on a future EU-UK relationship. In Brussels last Thursday night, Mr Varadkar is reported in UK media to have "stood up to repeat his ritual plea for EU solidarity with Ireland over the border" but that Mrs Merkel came "straight back at him, reminding him that without a deal, there would be no backstop." This was a reference as to how the border would be kept open in a no-deal scenario, an issue the Government here is reluctant to publicly discuss. Asked by reporters yesterday if he over-promised by saying the backstop was bulletproof, Mr Varadkar said: "The backstop being bulletproof is contingent on the Withdrawal Agreement being ratified. I've never made the assumption that it'll be ratified but I do think it still can be ratified. That's in the hands of the House of Commons." The Government anticipates "difficult discussions" on this issue in the event of no deal. However, critics in the UK government, and the DUP, say the Withdrawal Agreement debate on the backstop is redundant if the Government here believes the border can remain open in the event of a no-deal Brexit. The French president sought assurance from Mr Varadkar in the closing moments of a marathon session of talks last Thursday night, as the leaders looked to settle on mid-April as the new cliff edge. "What will happen if there is a no-deal Brexit on 12 April?" Mr Macron is reported to have asked the Taoiseach. "Would you be fine?" Mr Varadkar is said to have responded: "We can cope." A spokesperson for the Taoiseach confirmed to the Sunday Independent that the Taoiseach outlined to President Macron "all that had been done in terms of no-deal planning - legislation, works at the ports and airports, custom officers and inspectors hired, a budget surplus so we have the capacity to borrow if we need to bail out businesses and farmers, to protect incomes and jobs, and the cash reserves in case there is market turbulence." The EU is expected to work intensely over the next three weeks on its plans for the Irish Border in the event of a no-deal Brexit. Mrs Merkel asked why, so close to Brexit, the EU had not drawn up plans to avoid a hard border and urged officials to "get a move on". Speaking at his party's conference in Wexford yesterday, Mr Varadkar said the Government's plan of action for avoiding a hard border in the event of a no-deal Brexit is "very rough and very preliminary". He admitted there was still no way of avoiding border infrastructure without something that "looks like the backstop". The Fine Gael event was attended by German politician Manfred Weber, who is tipped to take over from Jean Claude Juncker as president of the European Commission. He expressed severe reservations about granting the UK another extension to Brexit because "political cowardice now has the potential to infect the European decision-making process". He said other member states "need legal and political certainty" ahead of the European Parliament elections in May. "This is the last chance to create certainty," Mr Weber said. The DUP's chief whip Jeffrey Donaldson shared a stage at the conference with Tanaiste Simon Coveney. He said it was an accident that the border became the "centre of the pit on Brexit". Mr Donaldson said trust issues between all sides was adding to the disagreements over the backstop. In a statement that received applause, he also suggested that the Republic should join the Commonwealth as it is a place "where Ireland's voice should be heard". Mr Coveney later played down the significance of the applause, saying Fine Gael members just wanted to make Mr Donaldson feel welcome. Meanwhile, more than one million demonstrators flooded central London yesterday to demand the people are given a final say over Brexit. Organisers of the 'Put it to the People' protest claimed it was one of the biggest demonstrations in British history. Marching bands, music, whistles, chants and cheers amplified the protest. 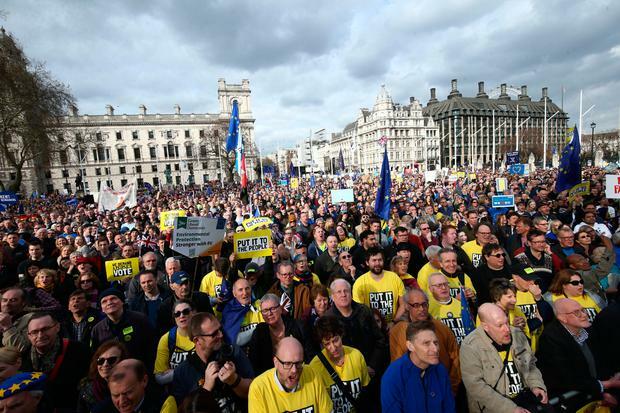 Placards urged the government to "revoke article 50" and for Brexit to be put to the people. Scottish First Minister Nicola Sturgeon, former deputy PM Lord Heseltine and London mayor Sadiq Khan were also expected to take the stage.